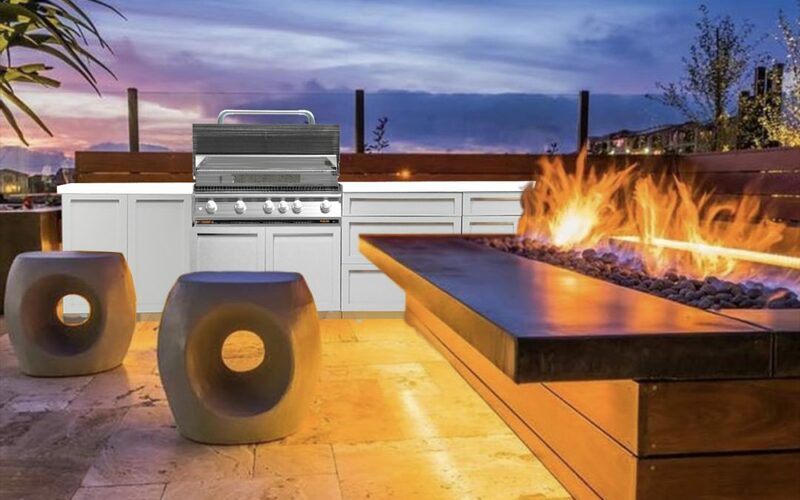 How to plan a perfect outdoor kitchen - 4 Life Outdoor Inc. When planning your outdoor kitchen, it’s all about location and ease of use. Here are a couple tips to make planning your outdoor kitchen easier. Location is everything when it comes to planning an outdoor kitchen. Not only will placing it in the wrong spot be inconvenient and uncomfortable, but it could also be dangerous. Start by locating any utility lines, underground and overhead, and design with those in mind. You don’t want to cut into buried lines during the building process, nor do you want to build directly under an overhead power line that poses a risk every time you raise an umbrella. Consider the weather. You’ll have more fun in your outdoor kitchen if you locate it away from windy or overly sunny areas. Plan to build your space within natural windscreens and shade from your landscaping. 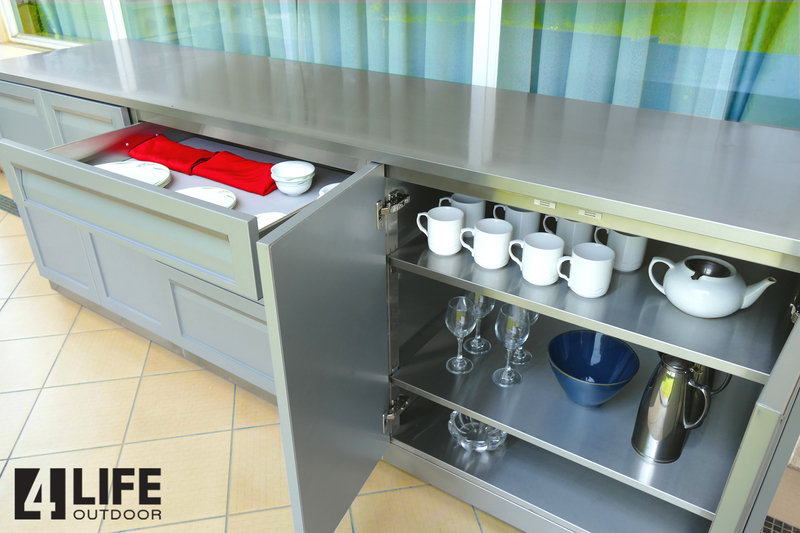 Install elements to protect the kitchen from the elements that pose a challenge for comfort and cooking. Traffic flow and the proximity to your indoor kitchen are worth considering. Plan a spot that places the two kitchens conveniently close. Grill, rotisserie, oven, stovetop, brick oven, blender, wine cooler — there are so many choices. But if you aren’t using them regularly, they’re needlessly taking up counter and cabinet space. Before going overboard on the appliances, ask yourself what you’re going to be cooking and what you’ll use. Generally, you’ll need a refrigerator and a grill or other cooking source, as well as some storage and prep space. Embellished wood cabinetry makes a bold statement in an indoor kitchen, but exposure to the elements makes wood cabinets impractical for the outdoors. Instead, opt for stone, concrete, or stainless steel countertops and cabinets. It’s said that the kitchen is the heart of the home; when you’re entertaining, guests often congregate in or near the kitchen to visit with the cook and each other. Arrange your outdoor kitchen to allow for that. Site your dining and lounging areas near enough that you can chat with guests while preparing the meal. Set the ambiance with good lighting. Add brighter lights to pathways, cooking areas and activity areas, then go for adjustable lighting in the dining or lounging areas. Need Outdoor Kitchen Design Help?